23rd- With Nathan’s family. There were 10 adults and 6 children. 25th- At our old church, afternoon with friends in Winsted and spent the evening with my brother and his wife. Today, I got up at 5:30. I went and ran 4 miles, came home, sent Nathan to run 3 miles, showered, dressed Isaac, packed the van, bought Dunkin’ Donuts, programmed the gps with our destination and we were ready to roll at 8:15. Today’s trip was about 9 hours of driving. Factoring in potty breaks every two hours and a break for lunch, we arrived at 6:45. Not bad. Now, for the fun of a family of 5 with three small children all sleeping in one room. Just like in the olden days! This morning, as soon as Nathan left, Audrey started whining, Ethan’s dirty clothes were on the floor and one of the kids had forgot to flush the toilet. Seeing it written out like this, it doesn’t seem like a big deal. It felt like a big deal this morning. I was so angry and I yelled and said things I shouldn’t have. I need to start a fund to pay for therapy for my kids. I don’t remember hearing you yell. Ever. You weren’t perfect, but I think you figured out a few things about parenting by the time you were in your 50’s. I miss you. I don’t know how to be a mom. I wish I had appreciated you more and worked on making our relationship better. So many dreams died with you. I’m sorry I wasn’t a better daughter. I miss you. “Mom’s hidden desire for Summoner Wars” He was rolling on the floor laughing over his creativity. At least he’s learning, right? Author amyPosted on November 16, 2012 Categories homeschooling4 Comments on Boys. . .
Wednesdays are fun days for us. The kids have their own class with other homeschool and preschool aged kids while I have Bible study and then in the afternoon we have History Club! About a month ago, my friend Katherine asked me if we wanted to do history with her kids and another friends kids. The curriculum that they were using looked great and the ages of the kids are perfect. Everyone has at least one friend near their age. Even Isaac has a little buddy! The moms take turns preparing some hands-on lesson/project for the kids to reinforce what we’re learning at home. I taught the kids about the Jewish hoiday Purim when it was my turn and I made Haman’s ears (cookies!) for everyone to eat. Today one of the other moms led and the kids learned about the differences between Athens and Sparta and they got to make spears and swords. Ethan didn’t want to choose to live in either Athens or Sparta! Apparently, the idea of going off to train for war at the age of 7 didn’t sound appealing to him. We went to McKay’s today. It’s a place where you can bring your old books and movies that you don’t want and they buy them back and resell them. You can choose to get cash or store credit. We got $22 for the items we brought in today! With that, I picked up a homeschool book, some easy readers for Audrey, 2 books for Ethan and one for Isaac. We had money left over after all that! On the way there, we saw the TN Ragnar race runners. Ragnar is a relay race that goes for two days. There are 12 people on a team. So, when it’s your turn to run, you run whether it’s noon or 2 in the morning. Everyone runs 3 times and in the same order. The race in TN started in Chattanooga and ended in Nashville. Speaking of running, Nathan and I have been running. We don’t go together because we would need someone to watch the kids, but we’ve been getting three runs in a week. I did 2- 2 mile runs and 1- 3 mile run this week. My cardio strength is nowhere near what it was two years ago and I’m still having a little knee pain, but I was able to finish my run today. Next Saturday I’m supposed to go 4 miles. I have not run that far since fall of 2010. I will be thrilled if I can actually do it! We’re counting the days until our trip up north. We’re hoping the weather is good for travel! A few weeks ago, I was working on my Bible Study homework. One of the projects that the author asks of the reader was to list all the things that you could think of that you feel like you need to be content. I had no trouble thinking of things to put on the list. 1)I would like to be able to sell our home in Winsted. 2)I would like a house with a yard so the kids can go outside and play and run off energy. 3)I would like to lose 15 more pounds. 4)I would like to see some resolution in some relationships that have been hurt. and there are more things I put on the list. What if nothing changed for a long time or ever? Could I be content with the gifts that God has already given me? Those are powerful questions to ask. Charles N. Daggett age 74 of Watertown passed away on Tuesday, November 6, 2012 at his home in Watertown. He was born October 24, 1938 to Harley and Sylva (McNurlin) Daggett in Sebeka, Minnesota. Charles was a loving husband, father, grandfather, great grandfather and friend to many. Charles was preceded in death by his parents Harley and Sylva Daggett; and his son Charles Daggett. He is survived by his wife Jan; children Susan Daggett, Peter (Wendy) Daggett, Pat (Suzanne) Daggett; 6 grandchildren: Emily (Phil) Sendelbach, Sam Daggett, Dustin Daggett, Conrad Daggett, Thomas Daggett, Corrin Daggett; 3 great grandchildren: Hallie Sendelbach, Charlie Sendelbach and Benjamin Sendelbach; as well as his sister Aurora Boyer from Sioux Falls, SD. Charles attended school in Detroit Lakes and graduated from Minneapolis North. After graduation he enlisted in the Marines. He earned his undergraduate degree from Augsburg College and his graduate degree from Mankato State University. Charles was a wrestler in high school, in the marines, in college, and coached at Watertown. He was a teacher at Minneapolis schools, Minneapolis Technical College, and finished his career as the IT Director at Crown College. His hobbies included his hobby farm, playing tennis, and serving as the national registrar and webmaster for the Dexter Cattle Association. Charles attended Watertown Evangelical Free Church for more than 40 years where he served in many roles. We are sad to hear that Chuck passed away. He was such a great encouragement to Nathan. He thought the world of Nathan and it really helped to give him confidence. I’m so sad that we will not be able to be there for the memorial service. Please be in prayer for his family. Apparently, it takes a bit more to get through to me…which brings us to October’s ‘divine conspiracy‘. 5 weeks ago: In our Sunday evening life group, we covered how to have financial margin and as part of that how having such margin frees you to be more generous. 4 weeks ago: Stan Mitchell, a local pastor and regular speaker for our weekly devotionals at work, spoke on II Corinthians 8 and how we should not wait until we have “enough” money to be generous with it. 1 month ago: our church begins a capital campaign, encourages the church to fast something and pray about how we could increase our generosity and sacrificially give toward reducing the church’s debt and future ministries. Every Sunday since — poignant messages on tithing, generosity, and trusting God to provide. 2 of which were ALSO on II Corinthians 8. 4 weeks ago: Someone at church donated copies of Gordon MacDonald’s book, “generosity” so every life group and sunday school group could use it. We did so that first Sunday of the campaign. 3 weeks ago: Amy and Audrey helped at the Feed My Starving Children mobile pack. I couldn’t go, but I was so proud of my two favorite women going and helping to pack the 25K+ meals that were packed during their shift. 2 weeks ago: One of the staff members brought a video to the weekly staff meeting for us all to watch. It was about generosity. Last week: Shaun Groves, singer/songwriter and awesome advocate for Compassion International came to Lampo Devo and spoke on…wait for it…generosity and the importance of living simply so you can be generous with what you have beyond what you really need. I may be pretty slow when it comes to these things, but even I figured out this trend! And bit by bit, God has been changing my heart as well. There are two ways I can do this blog post. 2. )Tell you about the book and how it impacted me and encourage you get it yourself to read later. We were given this book from the church we were attending last spring. It was part of the “discovery” class for newcomers. 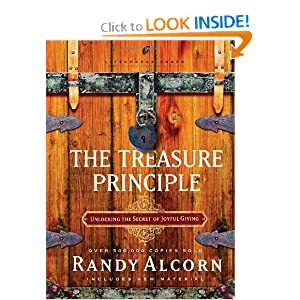 There are six principles mentioned in the book. I want to mention two. I wish I could talk about them all, but for the purpose of our story, I’m going to tell you about the two that made the biggest impact. *My heart goes where I put God’s money. Here’s a quote from the book, “By telling us that our hearts follow our treasure, Jesus is saying, “Show me your checkbook, your VISA statement and your receipts, and I’ll show you where your heart is.” That statement has slowly started to make a change in how we set up our budget. My bank statement proved me a liar. I said I believed that Christians should be giving to those in need. My bank statement said I didn’t care about the poor. I cannot overstate how true this has been for us. *God prospers me not to raise my standard of living, but to raise my standard of giving. Poor Nathan! I don’t think he’s going to let me read anything that he isn’t also reading anymore. I think he was surprised at the question, but he agreed that we need to decide what is “enough”. It was the start of a long conversation that’s still happening. We don’t know the answer. The cost of living goes up from year to year. Health insurance premiums keep skyrocketing. It’s hard to set a hard and fast amount of money that would be enough to live on 40 years from now. For us, right now, God is telling us that he wants us to live on a certain percentage of our money. It’s less than we’ve been living on. I don’t want to be too specific because I don’t want this to be about us and how much or how little we give or live on. It’s just the story that God is writing for us and this is the chapter we are in now. I’m a bit giddy about it 🙂 What if we could increase our percentage of giving every year?